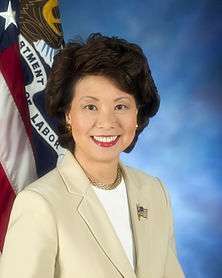 Elaine Lan Chao (趙小蘭; born March 26, 1953) is an American who served as the 24th United States Secretary of Labor under President George W. Bush from 2001 to 2009, and Deputy Secretary of Transportation under President George H. W. Bush. Born in Taipei, Taiwan, she was the first Asian American woman and the first Taiwanese American in U.S. history to be appointed to a U.S. president's cabinet. On November 29, 2016, it was announced that President-elect Donald Trump plans to nominate Chao for Secretary of Transportation when he takes office. 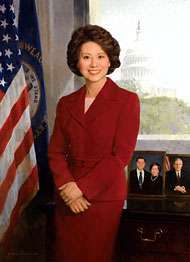 Elaine Chao was born in the capital city Taipei, Taiwan. The eldest of six daughters, Chao was born to Ruth Mulan Chu Chao (趙朱木蘭), a historian, and Dr. James S.C. Chao (趙錫成), who began his career as a merchant mariner and later founded a successful shipping company in New York City called Foremost Shipping. Chao's parents had fled to Taiwan from Shanghai on mainland China after the Chinese Communists took over following the Chinese Civil War in 1949. When she was 8 years old, in 1961, Chao came to the United States on a freight ship with her mother and two younger sisters. Her father had arrived in New York three years earlier after receiving a scholarship. Chao attended Tsai Hsing Elementary School in Taipei for kindergarten and first grade, and subsequently attended Syosset High School in Syosset, New York, on Long Island. She received a Bachelor of Arts in Economics from Mount Holyoke College in South Hadley, Massachusetts, in 1975 and an MBA from Harvard Business School in 1979. At Mount Holyoke, she played field hockey and was a member of the horseback riding club; she also edited the yearbook, served as the student representative for the economics department, and worked as a Mount Holyoke recruiter. Chao has received 36 honorary doctorates, most recently a Doctor of Humane Letters from Georgetown University. Before entering politics, Chao was vice president for syndications at Bank of America Capital Markets Group in San Francisco, and an international banker at Citicorp in New York for four years. Chao was granted a White House Fellowship in 1983 during the Reagan administration. In October 2013, Chao told a game show audience that the fellowship was part of a special program with Citicorp. "They selected outstanding performers within the bank and gave them an opportunity to support them for a stint in the government," Chao said. In 1986, Chao became deputy administrator of the Maritime Administration in the U.S. Department of Transportation. From 1988 to 1989, she served as chairwoman of the Federal Maritime Commission. In 1989, President George H. W. Bush nominated Chao to be Deputy Secretary of Transportation. From 1991 to 1992, Chao was Director of the Peace Corps. She was the first Asian Pacific American to serve in any of these positions. She expanded the Peace Corps's presence in Eastern Europe and Central Asia by establishing the first Peace Corps programs in Poland, Latvia, Lithuania, Estonia, and other newly independent states of the former Soviet Union. Following her service in the government, Chao worked for four years as President and CEO of United Way of America. She is credited with returning credibility and public trust in the organization after a financial mismanagement scandal involving former president William Aramony. From 1996 until her appointment as Secretary of Labor, Chao was a Distinguished Fellow with the Heritage Foundation, a conservative think tank in Washington, D.C. She was also a board member of the Independent Women's Forum. She returned to the Heritage Foundation after leaving the government in January 2009. Under her leadership, the U.S. Department of Labor undertook regulatory and legislative reforms in "protecting the health, safety, wages, and retirement security" of U.S. workers by "recovering record levels of back wages and monetary recoveries for pension plans, and obtaining record financial settlements for discrimination by federal contractors." She also restructured departmental programs and modernized regulations. In 2002, a major West Coast ports dispute costing the U.S. economy nearly $1 billion daily was resolved when the Bush administration obtained a national emergency injunction against both the employers and the union under the Taft–Hartley Act for the first time since 1971. 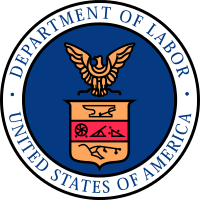 In 2003, for the first time in more than 40 years, the Department updated the labor union financial disclosure regulations under the Landrum–Griffin Act of 1959 to provide union members with more information on union finances. In 2004, the Department issued revisions of the white-collar overtime regulations under the Fair Labor Standards Act. In July and August 2003, Chao and her colleagues, Treasury Secretary John W. Snow and Commerce Secretary Donald Evans, took a bus across the country on their "Jobs and Growth Tour" aimed at promoting the benefits of the Bush administration's tax cuts. Chao's tenure as Labor Secretary saw two mine disasters for which she was criticized. Twelve miners were killed in the Sago Mine disaster on January 2, 2006, and three rescue workers died in the Crandall Canyon Mine disaster on August 6, 2007. Before the mines collapsed, Chao had cut more than a hundred coal mine safety inspections. According to the Christian Science Monitor, "Nearly half of the 208 safety citations levied in 2005 against the Sago coal mine where 12 men died this week were 'serious and substantial.'" On December 10, 2008, Chao announced that the Department of Labor's Mine Safety and Health Administration (MSHA) had, in the first year of the agency's 100 Percent Plan, achieved its goal of completing every mandated regular inspection for the year, a first in the agency's 31-year history. A 2008 report by the department's inspector general found that despite implementation of the Mine Improvement and New Emergency Response Act of 2006, mine safety regulators did not conduct federally required inspections at more than 14% of the country's 731 underground coal mines, and that the number of worker deaths in mining accidents more than doubled to 47. A 2009 internal audit appraising an Occupational Safety and Health Administration (OSHA) initiative focusing on problematic workplaces revealed that employees had failed to gather needed data, conducted uneven inspections and enforcement, and failed to discern repeat fatalities because records misspelled the companies' names or failed to notice when two subsidiaries with the same owner were involved. However, OSHA statistics for 2007 and 2008 revealed that overall workplace fatality rates and workplace injury and illness rates were "both at all-time lows." A report by the U.S. House Committee on Oversight and Government Reform, under the Chairmanship of Henry A. Waxman (D–Calif. ), alleged that Chao and other White House officials campaigned for Republican candidates at taxpayer expense. The report described this as a violation of the Hatch Act of 1939, which restricts the use of public funds for partisan gain, but no action was taken by any entity with responsibility for enforcing the Hatch Act. In 2009 Chao resumed her previous role as a Distinguished Fellow at the Heritage Foundation, and she contributes to Fox News and other media outlets. She also serves as a director on a number of corporate and non-profit boards, including the Institute of Politics at the Harvard Kennedy School of Government, Wells Fargo, NewYork–Presbyterian Hospital, News Corp, Dole Food Company, and Protective Life Corporation. In June 2011, she was awarded the Woodrow Wilson Award for Public Service. In 2011 and 2013, Chao attended Shanghai signing ceremonies for Capesize bulkers launched by the Foremost Group, her father's company, where she spoke publicly about U.S.–China relations. At the 2013 ceremony, Chao stated, "The U.S.-China relations[hip] is among the most important bilateral relationships in the world. And as such, there is no other alternative but to have a harmonious and a cooperative relationship. As with any relationship, there are bound to be ups, downs, disagreements, but in the overall scheme of things, in the overall direction, for the benefit of the world, [the] U.S. and China must get along, and must find a way to do so." In 2013, Chao recorded a motivational video to inspire Asian-American children. Chao is a distinguished fellow at the Hudson Institute. She also organized the "orientation for the spouses of Republican senators" in Washington, D.C. In 1993, Chao married Mitch McConnell, the senior U.S. Senator from Kentucky and the eventual Senate Majority Leader. They were introduced by Stuart Bloch, an early friend of McConnell's, and his wife Julia Chang Bloch, a Chinese American and a future U.S. Ambassador to Nepal, the first Asian American to serve as US Ambassador, who mentored Elaine Chao. Bloch described Chao as a "tiger wife," a reference to Amy Chua's 2011 book about her disciplinarian parenting style. Previously, she had dated C. Boyden Gray, the White House Counsel to President George H. W. Bush. In the two years leading up to the 2014 U.S. Senate elections, she "headlined fifty of her own events and attended hundreds more with and on behalf of" her husband and was seen as "a driving force of his reelection campaign" and eventual victory over Democratic candidate Alison Lundergan Grimes, who had portrayed McConnell as "anti-woman." After winning the election, McConnell said, "The biggest asset I have by far is the only Kentucky woman who served in a president's cabinet, my wife, Elaine Chao." Additionally, she adds "a softer touch" to McConnell's style by speaking of him "in a feminine, wifely way," as Jan Karzen, a longtime friend of McConnell's, put it. She has been described as "the campaign hugger" and is also known for bipartisan socializing. For example, in 2014 she hosted a dinner with philanthropist Catherine B. Reynolds to welcome Penny Pritzker as Secretary of Commerce, where she spent the evening socializing with Valerie Jarrett, Obama's top advisor. The New York Times has described her as "an unapologetically ambitious operator with an expansive network, a short fuse, and a seemingly inexhaustible drive to get to the top and stay there." It reported that as labor secretary, she "had gold-colored coins minted with her name in bas-relief and employed a "Veep"-like staff member who carried around her bag." Chao is the oldest of six sisters, the others being Jeannette, May, Christine, Grace, and Angela. The New York Times reported that "several of her five younger sisters married Wall Street titans, including Bruce Wasserstein, the late owner of New York Magazine." Her father, James S.C. Chao, is a shipping magnate who founded the Foremost Group, a company whose vessels are all registered in Liberia, one of which while docked in Colombia had 40 kg of concealed cocaine seized by narcotics officials. In April 2008, Chao's father gave Chao and McConnell between $5 million and $25 million, which "boosted McConnell's personal worth from a minimum of $3 million in 2007 to more than $7 million" and "helped the McConnells after their stock portfolio dipped in the wake of the financial crisis that year." In 2012 the family donated $40 million to Harvard Business School for scholarships for students of Chinese heritage and the Ruth Mulan Chu Chao Center, an executive education building named for Chao's late mother. Ruth Mulan Chu Chao returned to school at age 51 to earn a master's degree in Asian literature and history from St. John's University in the Queens borough of New York City. 1 2 3 4 5 6 Horowitz, Jason (May 13, 2014). "Girding for a Fight, McConnell Enlists His Wife". New York Times. ↑ "James S. C. Chao". Horatio Alger Association of Distinguished Americans. Retrieved March 3, 2013. ↑ "Elaine L. Chao Biography". Encyclopedia of World Biography. Retrieved March 3, 2013. ↑ Christopher Marquis (January 12, 2001). "Woman in the News; A Washington Veteran for Labor; a Tested Negotiator for Trade; Elaine Lan Chao". The New York Times. ↑ Anne-Gerard Flynn (November 6, 2014). "Woman in red dress with Mitch McConnell: Elaine Chao, wife, former labor secretary, and Mount Holyoke graduate". The Republican. ↑ "Elaine L. Chao Official Biography". Retrieved May 3, 2014. ↑ "Chao Receives Doctorate from Georgetown University". Retrieved May 16, 2015. 1 2 "Elaine L. Chao". Bloomberg Business. Retrieved 18 February 2015. ↑ "[开讲啦]20131026 赵小兰——永远不要将门关上". ChinaVideos 中国纪录片. Retrieved August 18, 2014. 1 2 "Elaine L. Chao Biography". Bio. Retrieved September 9, 2014. ↑ Schreiber, Ronnee (2011). "Pro-Women, Pro-Palin, Antifeminist: Conservative Women and Conservative Movement Politics". In Aberbach, Joel D.; Peele, Gillian. Crisis of Conservatism? : The Republican Party, the Conservative Movement, and American Politics After Bush. Oxford: Oxford University Press. p. 135. ISBN 9780199764020. ↑ Elaine Chao (December 11, 2008). "Portrait Unveiling Remarks". Elaine L. Chao. ↑ "Elaine Chao". Mount Holyoke College. Retrieved 18 February 2015. ↑ David E. Sanger; Steven Greenhouse (October 9, 2002). "President Invokes Taft-Hartley Act to Open 29 Ports". New York Times. ↑ W. James Antle III (January 14, 2009). "Ciao, Elaine". National Review Online. Retrieved March 3, 2013. ↑ "Bush economic team hits the road to promote tax cuts". Kentucky New Era. July 29, 2003. Retrieved April 25, 2012. ↑ "GAO Case Studies from Ongoing Work Show Examples in Which Wage and Hour Division Did Not Adequately Pursue Labor Violations – Statement of Gregory D. Kutz, Managing Director Forensic Audits and Special Investigations" (PDF). July 15, 2008. ↑ 解读美国第一位华裔部长赵小兰及其家族 (in Chinese). cncsj.net. November 24, 2009. Retrieved August 10, 2014. ↑ Mark Clayton and Amanda Paulson (January 6, 2006). "Sago raises red flags for mine oversight". The Christian Science Monitor. ↑ "MSHA Completes 100% of Annual Mine Inspections" (PDF). Retrieved December 10, 2008. ↑ Michael A. Fletcher (December 1, 2008). "Labor Dept. Accused of Straying From Enforcement". The Washington Post. Retrieved February 4, 2012. ↑ Smith, R. Jeffrey (April 2, 2009). "Initiative On Worker Safety Gets Poor Marks: IG's Report Links Weak Enforcement To Job Fatalities". The Washington Post. Retrieved February 4, 2012. ↑ "U.S. Labor Department's OSHA highlights another successful enforcement year in FY 2008" (PDF). Retrieved December 19, 2008. ↑ "OSHA Injury & Illness Data FY2007". Retrieved December 19, 2008. ↑ Carol D. Leonnig (November 25, 2008). "GAO Report Says Labor Department Misled Congress on Cost of Outsourcing Jobs". The Washington Post. Retrieved February 4, 2012. ↑ "Better Cost Assessments and Departmentwide Performance Tracking Are Needed to Effectively Manage Competitive Sourcing Program" (PDF). November 2008. Retrieved February 4, 2012. ↑ The Activities of the White House Office of Political Affairs Archived December 3, 2009, at the Wayback Machine. ↑ R. Jeffrey Smith (October 15, 2008). "Report Details Bush Officials' Partisan Trips: House Panel Finds Federal Appointees Attended Many Events on Taxpayers' Dime". The Washington Post. Retrieved February 4, 2012. ↑ "Elaine Chao: Director of the Day". Center for Economic and Policy Research. Retrieved 18 February 2015. ↑ "Elaine L. Chao, director since 2011". Wells Fargo. Retrieved 18 February 2015. ↑ "Dole | Company Info | Biography". Dole. Retrieved February 4, 2012. ↑ "Protective Life: Board of Directors". Protective Life. Retrieved February 4, 2012. ↑ "Bush Cabinet Member Will Advise Gyro". Gyro. Retrieved February 4, 2012. ↑ Rick Segal (October 27, 2011). "CMOs Explore Work-Life Balance and Brands". Forbes. Retrieved February 4, 2012. ↑ "Louisville 2011 Woodrow Wilson Awards". Wilson Center. June 24, 2011. Retrieved February 4, 2012. ↑ "Bloomberg Family Foundation Announces Four New Board Members". Bloomberg Philanthropies. April 5, 2012. ↑ Youngman, Sam (January 21, 2015). "Elaine Chao resigns from Bloomberg board as it increases 'Beyond Coal' investments". Lexington Herald-Leader. ↑ "Angela Chao Attends Naming Ceremony of Lan May in Shanghai, China". YouTube. Angela Chao. Retrieved August 18, 2014. ↑ "前美国劳工部长赵小兰：中美关系应着眼世界". youtube.com. Glover Danny. Retrieved 18 August 2014. ↑ "20130912 说给孩子第1季 赵小兰". 凤凰卫视精品官方频道 iFeng Premium Comment. Retrieved 18 August 2014. ↑ "Open house set Nov. 12 for new McConnell-Chao archive". University of Louisville Today. University of Louisville. November 11, 2009. ↑ "Mission of the Archives". McConnell-Chao Archives and Civic Education Gallery. Retrieved 18 February 2015. 1 2 Jay Newton-Small (November 9, 2014). "Mitch McConnell's Secret Weapon: His Wife". Time Magazine. ↑ Bailey, Phillip M. (August 4, 2014). "Democratic Strategist Under Fire for Criticizing Mitch McConnell's 'Asian' Wife". WKMS. 1 2 "Paid Notice: Deaths – Chao, Ruth Mulan Chu". New York Times. August 8, 2007. ↑ Michel Martin (July 18, 2012). "For Elaine Chao, A Tough Voyage To U.S. Leadership". NPR. ↑ Horowitz, Jason (2014-05-13). "Girding for a Fight, McConnell Enlists His Wife". New York Times. ↑ "Mitch McConnell's Freighted Ties to a Shadowy Shipping Company". The Nation. ISSN 0027-8378. Retrieved 2016-11-30. ↑ John Bresnahan; Manu Raju (June 12, 2009). "Members' fortunes see steep declines". Politico. ↑ Fang, Lee (October 30, 2014). "Mitch McConnell's Freighted Ties to a Shadowy Shipping Company". The Nation. ↑ John Lauerman (October 12, 2012). "Harvard Business School Gets $40 Million Gift From Chao Family". Bloomberg Business. ↑ "Harvard Business School Building Boom Continues". Harvard Magazine. October 12, 2012.